Spot silver, like many other commodities last week, saw a re-tracement from the recent bullish trend pulling back to close below the 9 and 14 day moving averages and ending the week at $23.15 per ounce as a small hammer candle. As such this hinted at a potential reversal in the recent short term weakness which has duly arrived this morning, courtesy of the G20 and further US dollar weakness which has seen commodities gain this morning as a result. Spot silver is trading at time of writing between the short term moving averages, having touched an intra day high of $23.84. In the short term we can expect to see a break and hold above the $24 per ounce level and this will then provide a solid platform and a springboard for a move to test the high of the previous week at $24.88 in due course. 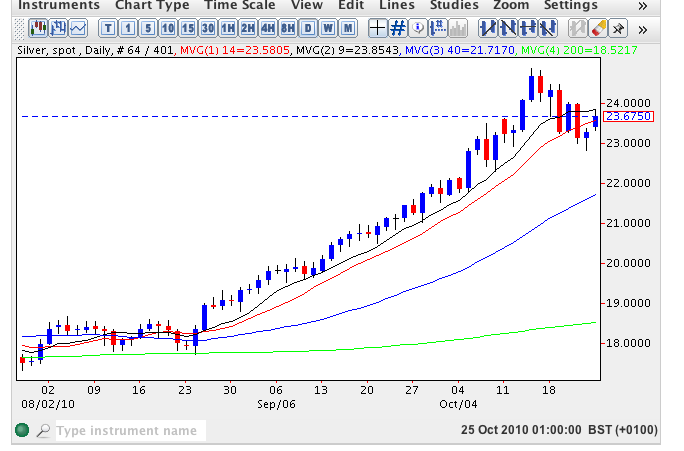 Once above this price level expect to see the commodity move firmly higher once again, fully supported by all four moving averages and on towards our medium term target of $26.50 per ounce in due course.